At least five construction workers were buried alive under the heaps of earth and concrete when a retaining wall of an under construction building collapsed on the temporary hut they were living in on Sunday morning. The tragic incident occurred at around 6.30 am at Doni Colony, a few kilometers from Itanagar. 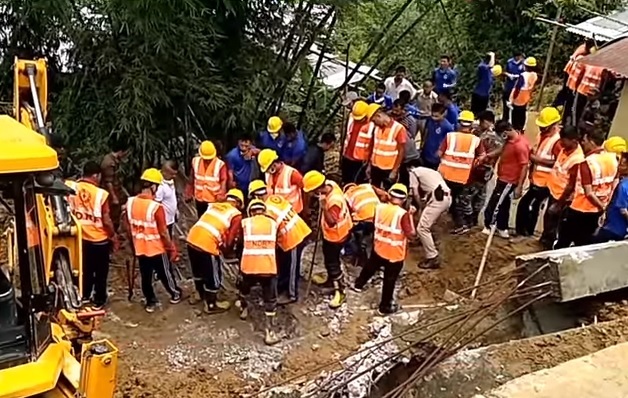 Following the accident, personnel of NDRF E-Company and Itanagar Fire and Emergency Services were pressed into service and the bodies were recovered after hours of struggle. The deceased have been identified as Pappu Katiya (20), Pappu Garel (21), Kanha Kenwar (40), Babloo Telenga (19), and Jiten Telenga (19). All the victims were from Bishwanath Charali, Assam. Locals of the colony informed that there were actually four labourers living in the temporary hut, however, a fifth person had joined them on Saturday night. On being informed, Capital Complex deputy commissioner Prince Dhawan, DIG Tusar Taba, disaster management secretary Bidol Tayeng and other officials visited the site to gather first hand information on the incident. Dhawan said the district administration will extend all possible assistance to the family members of deceased and ex-gratia as per the norms would also be released at the earliest. The deputy commissioner appealed to the people to take extreme precaution during monsoon and to shift to other safer locations if needed. He said the administration has also asked the residents living near the site to move to a safer location as the NDRF team reported that the soil is still loose in the area. Local MLA Techi Kaso also visited the spot and later met the family members of the victims at the R K Mission hospital here. Kaso, while terming the incident unfortunate informed that he would arrange vehicles for the bodies to be transported to their native places.